Before we even received our Argonaut frameset for review, we had the opportunity to document the build process. It made the anticipation even greater. Now, having put hundreds of miles on it, from Florida through the mountains of western North Carolina, I have to say it’s both one of the more interesting road bikes I’ve ever ridden, and the one I’ve most wished I could hang onto. The majority of the frame is UD carbon, with woven carbon in a few areas to reduce vibration or add strength in tight corners. The headtube is all woven carbon because it’s easier to cut and shape for headsets. One of the great things about using monocoque construction is the ability to shape not just the tubes, but the way each tube flows into the other. And the Argonaut makes full use of that at just about every intersection. …which flows directly into the bottom bracket, and then up the seat tube. The finish doesn’t hide the carbon layers, showing off the various shapes and sizes used to form each section of the frame. There’s not a round tube to be found. Note the small bits of woven carbon in the crux of the seatstay-seat tube junction. All of the shaping is done so they can make things stiff enough without having to use oversized or reinforced round tubes, which would add weight. The seat mast carries the seat tube’s shape all the way up, which uses a custom shaped mast topper with an ENVE clamp system for the saddle’s rails. The frame includes three spacers in the same shape as the mast that can be stacked to raise the topper’s height a bit. I raised the topper a bit (about 1/4″) without using a spacer and it didn’t slide down during riding, but they’re included if you want. They’ll provide about 2cm of extra height support. The shape and layup and all done so Ben can customize the comfort and stiffness for each rider. 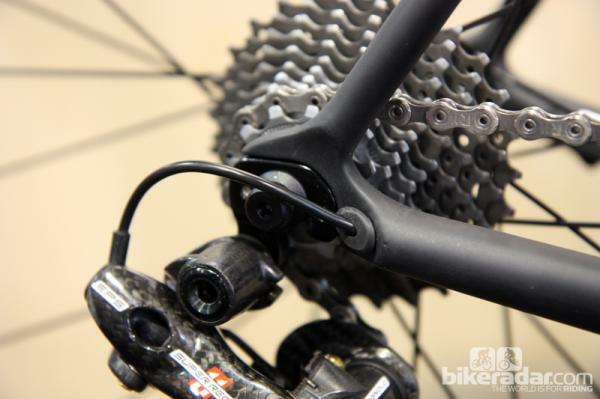 At first glance, it looks like metal dropouts…but the blue parts are all carbon. Where many brands use chunked woven carbon to press into molds, Argonaut uses UD chunks. There are metal inserts in the frame that they bolt into, and the actual dropouts are 6/4 titanium. The paint on the dropouts did chip easily when the wind blew the frame over during photographing, so a small bottle of touch up paint would be a welcome addition. The frame was sent to us with a Chris King PFBB30 bottom bracket and headset installed. Weight for that combo is 1,140g. We’ve weighed both of those King parts separately, which come in at 105g and ~119g (162g with the top piece & cap) respectively, so frame weight without them would be about 916g. Pretty darn good for a 58-59 equivalent frame size! The complete bike, with pedals (but without the seat bag or computer mount) came in around 15.3lbs with Shimano Dura-Ace 9000, Keywin Pedals and Ritchey’s WCS bar and stem. I tend to ride a bit more upright, so even with a slightly raised headtube, I still had a few spacers in there. Ben used the geometry and measurements from the fit I did for the Parlee Z5 we tested. Even though this was custom built for me, Ben stuck with a fairly traditional layout so it could be used by others, too…we did have to return it, after all. Being full custom, it could be built anyway you want. Cable stops are standard, external affairs, which makes it easy to work on and lighter overall. The rear brake cable runs just far enough under the downtube that it didn’t rub my knee and is virtually invisible from the riding position. The bottom bracket section isn’t as big as some mega-racers these days, but looks big in comparison to the Argonaut’s smaller tubes. It’s appropriately stiff under power, standing or sitting, without feeling like a slab of marble over the bumps. They’ll paint it any way you want, for a charge, but I really liked Argonaut’s basic blue on matte black standard paint scheme. When reviewing a custom bike, or reading a review of one, it’s important to remember they can be built any way you want. Need a super stiff crit racer? Or a relaxed, fondo tourer? No problem. The builder should talk to you at length about your riding style, preferences and body type. The real trick is how well they’re able to take all that information and turn it into a bike that justifies the cost. Particularly a freshman builder or, as in this case, someone’s who’s just started with a new material. My preference, which I shared with Ben over several emails and a phone conversation, was something that would be comfortable all day long but also hold up to the occasional city limits sprint. Steering should be precise without being twitchy. When he first started, Farver came up with the layups and numbers by simply building a lot of bikes. He and a friend rode a lot of versions to find the baseline, modeling the layups to mimic his favorite steel frames’ flex characteristics. From there, they rode test mules that all started on the stiff end of the spectrum, dialing it back to get the feel they wanted. Once that baseline was dialed, they put a wide range of rider weights and sizes on them to figure out what changes needed to be made. In all, almost a dozen frames were built to arrive at initial standards, from which they figure out other changes based on customer input, body type and riding style. My test bike, which is frame #15, has the bottom bracket and downtube set near the center of his bell curve in terms of bending and torsion. Farver says that’s the sweet spot for most riders. For someone lighter or less powerful, he’d reduce the stiffness slightly, using the analogy of golf shaft and speed to explain: If a shaft is too stiff for a given swing speed, it’ll feel dead and won’t give that ‘snap’ at impact. Same with the bike, if it’s too stiff, it’ll deaden the ride and feel, well, lifeless. Too soft, though, and it’ll feel noodly. So, how did all that translate on the pavement? Pretty darn good, though it took that last big ride and some very fast descents to really bring it all together mentally and physically. Up until that last big ride, I’d mainly taken it around our local rolling hills and gently curved country roads around Greensboro, and the very flat, very straight roads on coastal Florida. One of my first tests of any bike is always the handlebar shimmy. The Argonaut flexed quite a bit more than other bikes, especially the much stiffer Culprit or Alchemy bikes I’d ridden. Fortunately, that didn’t seem to affect ride quality or handling on normal rides. Crit racers might find it unsuitable, but for my riding style, it seemed to lend to the overall comfort of the bike. And remember, he can make it as stiff as you want…they’re all custom. Over the months I had the bike, every ride was a good ride. Ben seemed to nail the comfort versus performance versus weight matrix that wanted. I could hammer up the hills and down the flats for interval training, or just spin through the fields and enjoy the scenery. Cornering was stable and confident, and the rear end’s compliance (likely coming in large part from the seat mast as I could watch it move a bit similar to others’ flex posts), it tracked well and never felt noodley. Thus far, I loved everything about the bike. Then we took it to the mountains. On the climbs, it was gold. But as the descents got faster and the turns sharper, I started to feel less confident. For the entire first half of the ride, I tried different hand and body positions to encourage it to follow my intended path. Once things got above 30mph, it just didn’t seem to work with me to get around the bends smoothly, and it only got hairier as speeds crept toward and over 40mph. It was fairly stable, it just didn’t seem to want to rail corners. I was mentally prepared to accept the compromise between overall comfort and high speed handling. Then, on the way back down Mount Mitchell, I started pressing down hard on the drops and shifted my body weight just a bit further forward. Boom: Magic. From then on, it was like a new bike on the descents. Putting that extra pressure on the bars -literally like I was trying to push the drops into the ground- made it fly through the corners. Suddenly, 45mph was exhilerating instead of terrifying. And I loved the bike even more. Were I ordering an Argonaut for keeps, I’d ask Ben to make the headtube a bit stiffer, but not much. The overall compliance of the bike made it exceedingly comfortable overall and probably saved me on a few of those big descents. We hit a few cracks and potholes at 40+ mph on the Parkway, not unlike those in the top action shot, and the bike took it in stride. Some of the guys on stiffer race bikes seemed a bit more shaken by them. And, even after 93 miles and all that climbing, I felt fresher than I had any right to. At $6,000 to $6,500, the Argonaut’s on the high end of what a custom bike goes for, but that gives you a unique take on custom carbon fiber that marries form and function to create a bike with real character. You know, kinda like a steel frame, except much lighter. If Ben gave me an exit interview, I’d say he 99% nailed it, with only the slight lack of head tube stiffness earning the 1% penalty. Ben’s off to a fantastic start, and I suspect his ability to morph a rider’s input and measurements into a dream bike will only get better the more he builds. Do I want one? Absolutely. Would I order one? Absolutely…if I could afford it. SIDE NOTE: If you remember, we also saw a prototype version at NAHBS. Ben says the second generation improves with the addition kevlar to soak up vibration better and with more HiMod fibers to make it lighter. It’s still not being offered officially, but they’re just starting to bring them up in conversation. Previous articleMoots Introduces Rogue 650B YBB, RSL Mountain Bikes & Vamoots Disc Road Bike! ‘Monocoque’ is a bit of a misnomer don’t you think? That frame is about as tube to tube as a frame gets. A ‘monocoque’ frame like the Cervelo RCA with it’s full continous front triangle construction would require a separate tool for each custom size. So the terms ‘custom’ and ‘monocoque tend to be mutually exlusive. Glad to hear there is a non-isp version in the works. The same bike that’s in Paved magazine this month? Nice bike, but if those are joints on the stays and tip tube I see, then they need to stop passing this off as monocoque. Nice frame. Seems like Sky should be riding these. Colors match perfectly. That is NOT a monocoque frame. If it had been it would require a unique tool for each custom build. Don’t think so.. Hate to be a hater and I applaud them for trying but $6000.00 for a stock geometry glue together carbon frame with THAT dropout design. Alchemy Xanthus for half the price. @andy – Monocoque does not mean “one piece” but rather means “structural skin.” It is a structural approach that in which the load is supported by the objects skin. It does not technically need to be produced in one piece. In this case, the frame has no internal ribs or supports, thus this frame is indeed a monocoque. The reviewer interchanges between “production” and “custom.” And if it’s custom, how so? Custom tube layup, custom geometry? Some combination? I am not asking cynically, I genuinely want to know. Love when people play semantics with the word monocoque. mono means ONE, not many. so by having multiple structure skins glued together disqualifies it from being a Monocoque frame. Cippolini R800 and R1000 bikes are a TRUE monocoque, where the whole bike is one single shell (Mono – coque), made in one clean sweep – not multiple pieces glued together. Misterha – Zevlin bar tape, and it’s awesome. gravity – argonaut has stock and custom sizing/geometry, but the layup is custom on all of them. I believe this one was a stock size frame. There’s really nothing “production” about them in the sense that they’re rolling off any assembly line. @speedy. Stressed skin tubes is and has been used on just about every bike frame ever constructed since the invention of the diamond frame safety bicycle… This is why the term monocoque is NOT used within the bike industry in the Wiki sense. It is completely meaningless since all tube to tube bikes are then also by definition monocoque. Andy, they just want to use the word monocoque. its a word used a lot in formula 1, etc. so they like what comes with using it and the association people make. its marketing. even the cervelo Rca is made in 3 or more parts and bonded. Wow all the people whinging about the use of “monocoque” have pretty much missed the point of the article, which is that the Argonaut bike is pretty good bike. Is there the option of getting the bike with a threaded BB? @psi Squavel, hope you dont whine about squavel/squared. i dont think i or anyone else wants to buy a pretty good bike, that weighs over 1100 grams (fork almost 400g) for $6000. i can find excellent bikes for half that and weigh a few hundred grams less. for the money they charge and the dentist that would buy these types of frames, the least they could do is not lie to the customer and say its a monocoque frame. so when they’re at the coffee shop talking about the monocoque construction, they dont get made fun of and commit suicide (dentist have the highest suicide rate). He’s right. I am a dentist and have been made fun of for thinking my bicycle was monocoque when it was really an aluminum frame. He’s right. I am a dentist and have been made fun of for thinking my bicycle was “monocoque” when it was really an aluminum frame. Best part is, your username is @Ducati! Brap. I asked earlier up there if this was the bike in this month’s Paved magazine. It’s not, the bike in the mag is ex-pro, and non-dentist, Joe Parkin’s, who wanted a bike that had a lively ride like the ti and steel bike he had while racing for Motorola. The dude seemed stoked on what he got. The bike weighed 15ish pounds, and rode exactly as he requested. Worth $6K? I dunno, to him it seems so. I don’t think Joe Parkin ever raced for Motorola. He joined Coors Light immediately after they ceased to be Motorola. Before that, he was racing for a bunch of Euro teams, and the only one I can remember is Tulip. As for BB30, PF30, BBevo81727, PF112, why threaded? Because it’s still the simplest and most effective answer to the question. Watch, in another couple of years, makers will be selling threaded bottom brackets again, this time as a solution to creaky, failure-prone, standard-less, press fit systems. Get that saddle bag off that bike! ducati your aluminum bike is not a monocoque but you may well be. This is a great idea and the spirit of it sounds great. But 6k for frame #20 or so. That is some R&D being passed on. May need more than 20 frames worth of experience to start hitting dentists up for $6k. The bike industry is rapidly pricing itself out of reality. Great to see Ben stepping away from his families business, Pella Windows, and putting his money into our sport. Best of luck! Wondering how you would compare the Alchemy to the Argonaut? Also can you comment on custom Ti vs these two carbon beauties. Both questions are in regards to ride quality differences? I have been around for a while and I’m always looking for a newer, better style of bike. It sounds like this would be ideal. I am a casual cyclist, but enjoy knowing my bike can handle more. As light and as stylish as this is, I want to give it a spin.